One of the most funniest movies I’ve ever seen. This movie has a complicated plot and a ton of humour throughout. Seth Rogen bring his unique flavor of comedy to the screen and James Franco does an amazing job! To be honest, I did not think Franco could be this funny :) The movie is pretty awesome, one of Seth and Evan’s best. The whole thing starts with Dale Denton (Seth Rogen) a process server who loves marijuana. Now, Dale goes to his dealer Saul Silver (James Franco), to buy some weed. Saul gives Dale a new breed of ganja, the pineapple express. After having a smoke and buying some, Dale tells Saul that he’s going to serve his last victim for the day Ted Jones (Gary Cole), now, Dale knows Ted as the local drug lord. So, when Dale goes to serve Ted, he witness Ted and a cop Carol Brazier (Rosie Perez) killing a guy, Dale panics and throws away the roach in his hand and flees in his car. Now, Ted is in the midst of a war with the Chinese for the drug lord status. Seeing Dale flee the scene, he thinks that Dale is a Chinese spy. Now, Dale all worried goes to Saul and he realises that he left the pineapple express roach in front of Ted’s house, and it could be tracked to Saul. 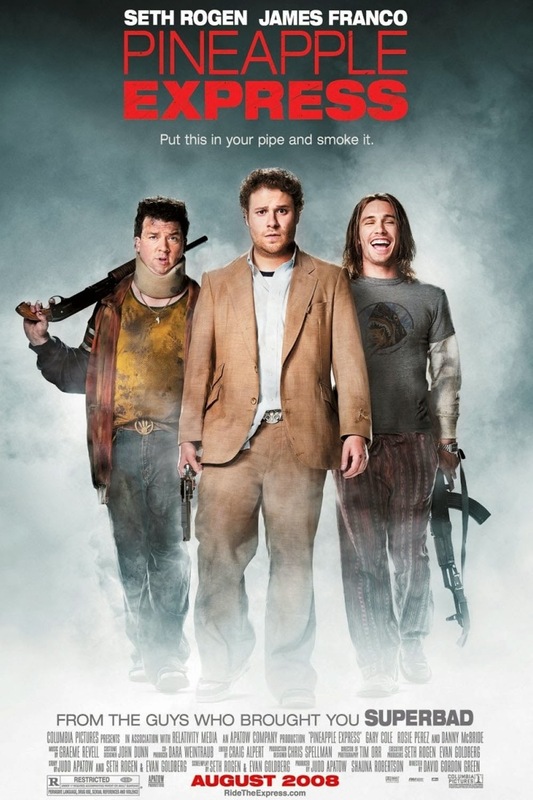 Now, Saul and Dale go to Saul’s dealer Red (Danny McBride), hoping to clear everything up. But unknown to them Budlofsky (Kevin Corrigan) and Matheson (Craig Robinson) are putting the squeeze on Red. And the question is, what will happen next? well, it all unfolds in a beautiful and, laugh until your stomach cramps style. It’s a pretty complicated plot for a comedy movie but these guys make it work, I mean some of the predicaments that they wind up in are hilarious. One of my favorite scenes is the car chase between the guys and the bad cop, with is extremely funny and it’s one of those scenes that could come only in such a complicated plot, so it all works out. And to add to that, the conversation between Dale and Saul are extremely funny! so definitely watch this movie.